Katie Ka Vang is hoping for a knockout of a show with "Final Round," her piece that chronicles her fight with cancer. In 2012, the Twin Cities playwright and performer was diagnosed with stage-four lymphoma, which she has fought gallantly and publicly. The cancer went into remission for two years after the initial diagnosis, but has since reappeared. Even as she has battled illness, Vang (pictured right in a photo by Rich Ryan) has continued to pursue her dreams. Some of her notable personal achievements include earning a master of fine arts in playwriting at Brown University, winning a writing residency at the Royal Court Theatre in London, and going parasailing. And now, she’s accomplishing another milestone: a show about her experience. Vang wrote and stars int he boxing-themed “Final Round” as a way to look at the lumps she's taken in her fight, but also the moments of grace. 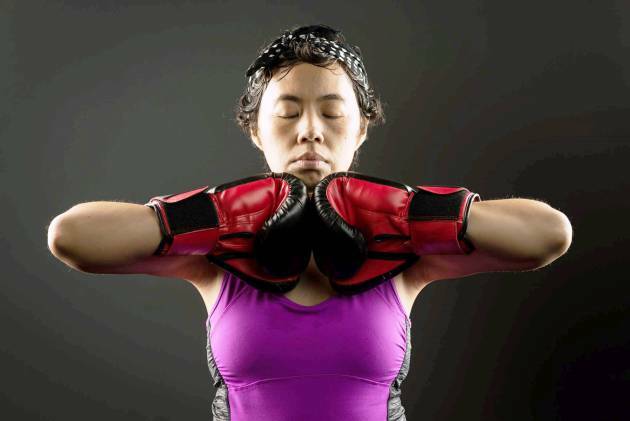 In the production, directed by Zaraawar Mistry at Dreamland Arts in St Paul, Vang “punches and kicks her way through cancer while living with her family, planning a Hmong wedding, and dreaming of eating ramen noodles again,” according to the show description. Vang intends for the show to be work to be done in two parts. “Final Round” kicks off that effort. It plays at 7:30 p.m. Thu.-Sat., 2 p.m. Sun., thru Oct 23, at Dreamland Arts, 677 Hamline Av. N. St Paul. $15. 651-645-5506 or online.